May 8 is the feast of Julian of Norwich, an English mystic who had a near death experience at age 30 when she received a series of visions known as Revelations of Divine Love or The Showings. Gather Hazelnuts, Ferrero Rocher candy, and a bell and place them on an altar table covered with a cloth. “All shall be well,” we pray desperately. We gather tonight at the convergence of three religious holidays: Ramadan, Shavuot, and Pentecost. Last Tuesday was the first day of the sacred Muslim month of Ramadan, the month when the Prophet Mohammed began receiving the revelation of the Quran. Sunday was the first day of the Jewish festival of Shavuot, which began in ancient Israel with the celebration of the spring wheat harvest and has become the time to celebrate a spiritual harvest — the revelation of the Torah at Mount Sinai. And Sunday was the Christian feast of Pentecost, when followers of Jesus gathered to celebrate Shavuot and were imbued with the Holy Spirit opening them to speak in many languages they had not known — in some ways opening the path to a multinational Christianity known as the birth of the church. During these holy times for three major religions, the government of the state of Israel, which claims to be a Jewish state, opened lethal gunfire on thousands of Palestinians at the Gaza border, killing more than 60 of them and injuring thousands more. A bloodbath! Name other world events. “All shall be well again,” we pray desperately. Loud are the bells of Norwich, as the people come and go. Here by the tower of Julian I tell them what I know. And let the winter come and go. All shall be well, I’m telling you, let the winter come and go. 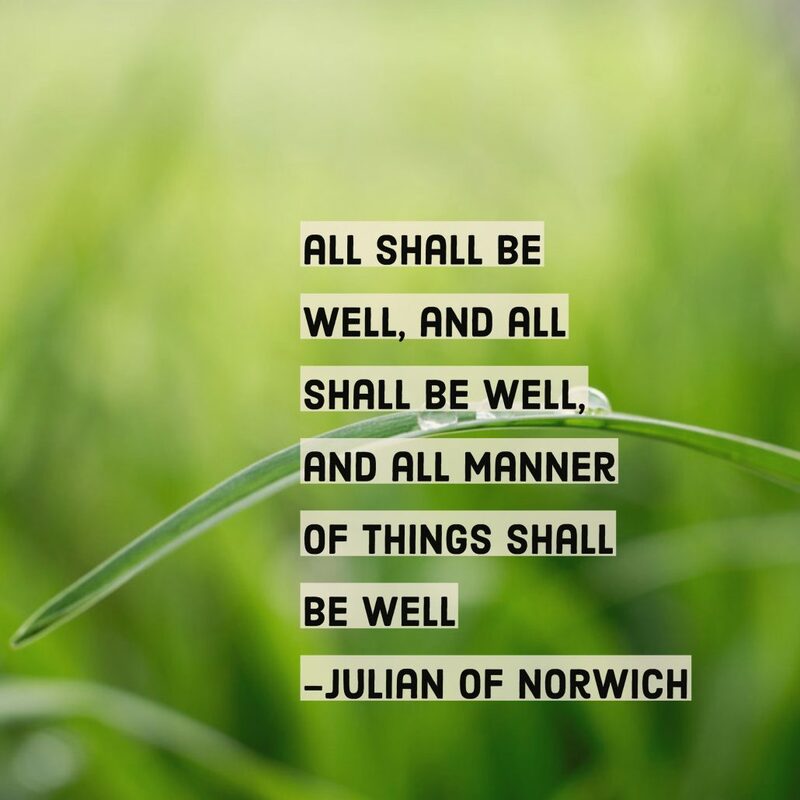 Julian of Norwich (c.1342-c.1413) was a fourteenth century English mystic and theologian who lived as an anchoress outside the walls of St. Julian’s Church in Norwich. When she was 30, she suffered a severe illness and had a near death experience. At this time she received a series of visions on May 8, 1373, which she later wrote down as Revelations of Divine Love or The Showings. Her writings depict her understanding of God’s compassion for the world. Julian witnessed three rounds of the bubonic plague, lost almost everyone she loved, and nearly died herself. She lived in a time of peasant revolts and the Great Schism. She experienced scandal and crisis in the church, with three claimants to the papacy each excommunicating the other. She reveals God’s hope and reminds us that God loves even the smallest creation. She proclaims that God is Mother and reminds us that women image the Divine. She affirms a God of unconditional love. She believes, All Shall Be Well. I marveled how it could continue, because it seemed to me it could suddenly have sunk into nothingness because of its littleness. And in this way everything has its being by the love of God. Like Jesus’ parable of the mustard seed, Julian’s Hazelnut is a little thing. Yet, God shows it to Julian as a sign of God’s love for creation. The least of things can yield a mystical vision. God is totally here, now. The fullness of God bursts forth in a humble hazelnut. Eat the Ferrero Rocher hazelnut candy and taste the fullness and sweetness of God. The hazelnut is the revelation of God whether God presents herself (and Julian used “Mother” as well as “Father” to describe God) through a mustard seed, a tongue of fire, or our own daily experience. For Julian, the hazelnut was a sign of hope, a sign of the love of God that sustains us. What things or events are signs of hope for you? Carrie Newcomer captured the spirit of the hazelnut in her song, “Holy as a Day is Spent.” In Newcomer’s song, she invites us to experience the holiness of whizzing cars, dogs running in their sleep, a simple breakfast, and doing our daily tasks. the third is that God keeps it. But what did I observe in it? Truly that God is the Maker, the Lover, and the Keeper. that there is absolutely nothing that is created separating my God and myself. Julian affirms a God of unconditional love — the maker, lover, and keeper of all — who delights in holding each created thing and being, and whose love works to make all things well. What do you think of Julian’s idea of the Trinity: God as Maker, Lover, and Keeper? To the property of motherhood belong nature, love, wisdom and knowledge, and this is God. The image of God as mother is ancient. Isaiah sings of God who comforts us as a mothers comforts her child (66.13). Luke’s gospel offers the image of God as a mother hen gathering her young (13.34). The 13th century mystic Mechtilde of Magdeburg uses the image of God as a great mother who bends and takes the child from the floor to her bosom. In our time, feminist theologians and ministers alike challenge us to think, as Mary Daly did, beyond God the Father to embrace God the Mother, and beyond God the Mother to more. How does Julian’s understanding of God as Mother broaden your understanding of the Divine? This month, begin every day with a short meditation or affirmation on what gives you hope, what symbolizes God’s love, and what reminds you that all shall be well. Write a letter to someone you love, someone you have nurtured, or someone who has nurtured you and tell them why they are special to you. Spend time in nature as a reminder that God loves all creation. Keep the hope alive that all shall be well while you continue to work for justice! Get out and vote this primary season! Join a local community action group that helps women and marginalized people run for local office. Attend the next Black Lives Matter march in your area. Donate to Medical Aid for Palestinians’ Gaza Emergency Appeal. Medical Aid for Palestinians (MAP) is responding to the large number of casualties in Gaza amidst the current violence there. Learn more about or get involved in the Sanctuary Movement to see how your neighborhood or congregation can support immigrants, refugees, and families being broken apart by deportation. let us go forth and be hopeful. let us go forth and call God Mother. let us go forth and show God’s love and compassion. let us go forth praying desperately, All Shall Be Well Again.